The paint work is starting to look a bit worn, but other than that its a lovely engine. In the past it has even successfully pulled passengers for public running at Abbeydale, but at the start of last year, it had a bit of a mishap and blew its superheater. It has been out of service ever since. 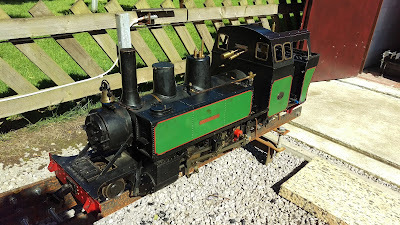 I've been participating in the effort to get it working again, as Kevin has issues holding small objects (and believe me - there are some VERY small nuts and screws on this thing), and getting the superheater out of the rather cramped and rather deep smokebox was a challenge. Not as much as getting it back in, mind! But, we have persevered and the poor thing is now capable of raising steam once more! This page is intended to document the seemingly endless list of little jobs that need doing to Mountaineer to get her fully back into service. Stay tuned! There is an awkward design point to this engine with regards to the grate. It is quite important, in case of emergency or simply to clear up at the end of a run, to be able to "drop the fire" in a locomotive. This is normally achieved by pulling a pin out and allowing the grate to fall out from under the engine, scattering the remains of the fire well clear. On Mountaineer, there is unfortunately a pony truck bolted directly under the grate and ashpan, which needs to be removed in order to drop said fire. This is held in place by two countersunk 2BA screws with allen sockets in them. The big problem with this is that if you are in a hurry to drop the fire, the last thing you need is to have to mess around finding the right allen key. 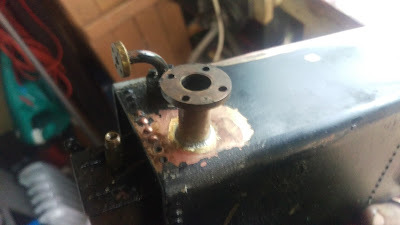 So, job No.1 has been to replace the allen screws with turned replacements, sporting a little T bar for undoing with your fingers when the engine is cold, as well as a milled slot to engage a flat screwdriver when the engine is a bit too warm for comfort! 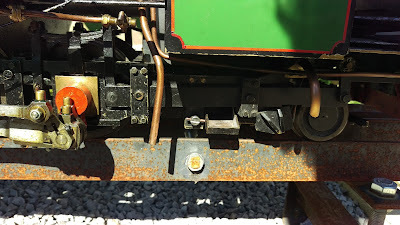 This is the pony truck, with the new screws in place. ...and here it is in situ on the engine. You can just about make out the new screw to the left of the little chute that leads out of the ashpan. I'm pleased with how well they blend in, and they should make operations that little bit easier and quicker. The two side tanks are perhaps the most distinctive feature of Mountaineer (at least, to me), and as they hold all of that vital water ready to go into the boiler, its quite disheartening to see the joint between the right hand tank and the balance pipe hanging apart, and letting water vanish onto the floor. Getting that repaired has been a priority job, and would allow me my first bit of repair soldering to platework! Silver soldering, I am comfortable with. Electronics soldering, i can do. Soft soldering things ive made, not a problem. This, however, would require soft soldering a part onto something that is already soldered together, requiring some pretty precise heat control to avoid destroying other joints. 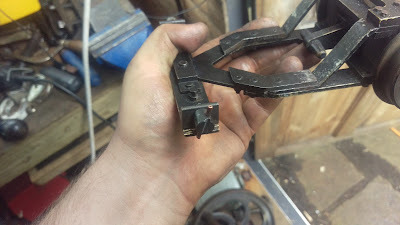 I managed this by cleaning the area and the parts thoroughly, fluxing the joint well and stacking bits of steel bar around the area I was working in to create a barrier and to carry away some of the heat I was generating.